Leaders who communicate effectively are more likely to create the environments necessary to engage and motivate the people around them. The road that leads to effective communication involves a journey of discovery and clarity to understand how individuals behave and what drives them to say or do certain things. Yet clarity and understanding can be difficult to achieve especially when information is missing or incomplete—DISC® Personality and Behaviour assessments provide the insights you need to adjust your leadership and communication approach to better meet the communication needs of those around you. 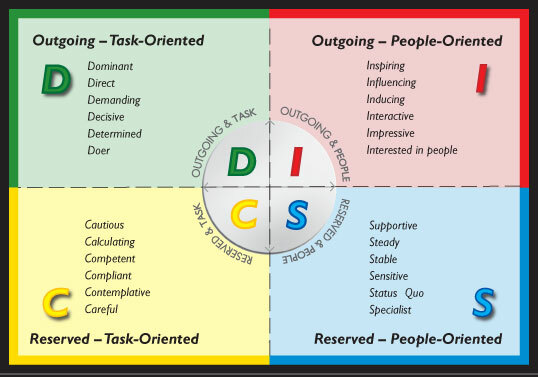 The DISC® personality and behaviour assessment tool was developed by Dr. Robert A. Rohm to help individuals and groups explore the four basic personality types and identify individual blends. The tool is easy to use and the behaviour insights provided can help you to improve your capacity to lead through improved communication. WCS is a recognized Personality Insights Institute accredited DISC® Behavioural Studies trainer and Certified Human Behaviour Consultant in good standing. Please contact us for information on how to arrange a DISC® Training at your organization or business to begin experiencing the “value” of improved communication. Recommend a visit to Dr. Rohm’s personal business page—he personally provided my DISC training and his videos provide a great overview of the DISC process and what the tool can do for you! Next Is it Time to Choose Leadership FIRST?